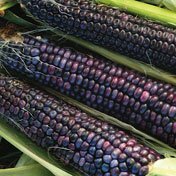 An eye catching American Indian vivid blue heirloom flint corn used as a traditional staple of the Hopi Indians in northern Arizona. The bushy, 5 foot stalks yield 8 to 10 inch ears, with smooth blue kernels. An excellent choice for making corn flour and the variety of choice to make tortilla chips. Great for beautiful decorations when dried. Planting Depth: 2-4″. Soil Temp. for Germ. : 60-85F. Days to Germ. : 4-12. Plant Spacing:12-18″. Days to Maturity: 100-110. Corn must be planted in blocks, not as a single row to ensure good pollination. Cover any roots that appear at the base with mulch. “Soil Association” registered and certified Organic – AP22387. Full growing instructions found below in the product description.